In the months since Steve Schwaid became news director at WGCL, the station’s news department has shed a couple of embarrassing habits. It no longer obsessively leads its newscasts with “only on CBS-46” exclusives, saving those moments for times when a) they seem to make sense and b) there aren’t other Big Stories that obviously deserve the lead slot. That’s good news for viewers with a hair-trigger gag reflex, and good for advancing the cause of making WGCL competitive. WGCL is doing some other interesting things. We’ve seen some multi-hit stories, with the first hit serving as an extended tease for the subsequent one. Teases are typically formulaic, “coming up next!” quickies. These are more informative and longer. The approach is interesting, and it doesn’t appear WGCL is overusing it. But honestly, we don’t watch enough to really know. 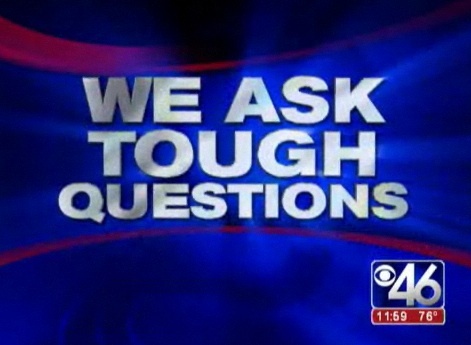 And WGCL has begun using a “we ask the tough questions” promo that we kinda like. One of the frustrations of reporting is that slick interviewees are often able to successfully dissemble and obfuscate and divert in the face of hard questions. Too often in a minute-thirty TV story, the slick answer shows up on TV without the context of the question. Frequently, the question is better than the answer. It highlights the issue. The downside is that it can cut into the reporter’s obligation to present the interviewee’s viewpoint in a “balanced” story. Viewers want to know that the hard question– the obvious question, maybe, in their minds– is being asked by the guy / gal slinging that microphone. Even when the answer is poor, it’s worthwhile to show the reporter asking the questions. Investigative reporters, like Richard Belcher at WSB and the I-Team folks at WAGA, do it consistently. It makes their stories better. WGCL is doing the “tough questions” campaign as stand-alone promos. But the station is also using it within the newscast sometimes as a lead-in, when the producer knows that a reporter has, in fact, cranked out a story with a hard question in it. It’s a compelling way to keep the viewer from clicking elsewhere. There’s a whole ‘nother angle to that “tough questions” thing. It can tempt a reporter to grandstand. And at WGCL, there’s the weird business of the tough questions asked in this perennial LAF favorite. We’ll rant again about this WGCL embarrassment — and how it’s changed — in another post. Meantime, let’s give WGCL and its new leadership some credit for giving that station a shot at some respectability. This entry was posted in WGCL on September 30, 2008 by live apt fire. Too few “massage services” ads…? The AJC reports that Creative Loafing has filed for bankruptcy. “CEO Ben Eason said the filing would help the chain improve its online business while it reorganizes its operations,” writes the AJC. “The bankruptcy petition was filed in Tampa, where the company’s based, and was timed to preclude an interest payment that was owed lenders on Wednesday. The debt load was substantially increased last year when Creative Loafing purchased the Chicago Reader and the Washington City Paper. Since then, advertising revenues for the print editions of the papers has deteriorated, as they have for newspapers nationwide. Over the same period last year, revenues were down between 10 and 15 percent. The Loaf’s creditors include the Georgia Department of Revenue and the company that prints its papers. This entry was posted in Creative Loafing on September 29, 2008 by live apt fire. … and WAGA devoted seven minutes of its evening news to an apartment fire. The Calibre Springs apartments in Sandy Springs had the peculiar timing to go up in flames in the middle of the 5pm newscast. WAGA did three live hits of coverage during the 5pm news, lasting three minutes, 2:45 and forty seconds. There was one more :40 taped anchor v/o at six. We heard the word “flames” thirteen times. We heard the word “smoke” ten times. We heard the word “water” nine times. We heard the phrase “as you can see” or variations thereof fifteen times. There were no injuries reported. It appeared neither station deigned the story important enough for nightside coverage. Is it news when an apartment bursts into flames? Yes, but not seven-plus minutes worth. Truth is, it’s kinda fun to watch a building burn to the ground. Those running the newsroom know that eyeballs are not likely to stray to the kitchen (or another station) when it’s showing flames and a “live” super. It plays to the cheap seats, occupied by precious viewers of local TV news. This entry was posted in WAGA, WSB on September 29, 2008 by live apt fire. TV news photographers don’t get enough credit. At some stations, they’re absurdly underpaid. At other stations, they’re being phased out. Yet they are the essence of TV newsgathering. “Without us, you’d be watching radio.” They like to say stuff like that. They are often multi-talented. Many are voracious readers. Some are gifted painters and folk artists. Some can write a script better than the TV reporter sitting next to them. (It’s) my least favorite part of the day. Why? Oh, I dunno – that feeling of utter helplessness as some former intern pitches his opinion of how I should spend my day…that trapped-gas sensation in my lower abdomen as some producer eyeballs me while recounting the wino revival she passed on the way to work …the rising bile in the back of my throat as an indifferent manager banishes me to twelve hours in a far flung live truck with the flick of his well-oiled Sharpie. Yeah, most days I’d rather take a two-by-four to the face than watch my immediate fate ricochet around a small conference room. There are plenty of newsrooms whose bossfolk wouldn’t allow such subversion. But it just happens that Pittman works in a newsroom headed by Karen Koutsky. When she worked at WAGA more than a decade ago, Koutsky was well respected and destined for (what passes for) greatness in the world of TV news. The fact that she doesn’t suppress Pittman’s mojo indicates that, even though she’s the VP of a medium-market newsroom, she hasn’t completely developed a taste for the Kool-Aid®. Good for her. It’s actually quite remarkable, the compulsion to suppress. It’s as if the higher-ups in certain TV newsrooms know that their foolishness doesn’t withstand analysis. Therefore, they suppress it. The fact that Race Bannon won’t write under his/her real name says it all. This, in an industry that likes to posture about freedom of expression — when it’s convenient for the production of the commercial product only. We rant. There’s a link to Viewfinder Blues to the right. You are urged to click it often. This entry was posted in Uncategorized on September 25, 2008 by live apt fire. Gasoline shortage / price stories often have a tediously one-note quality to them. Over and over, the video and storylines repeat. And it’s somewhat unavoidable. So give Ross Cavitt credit for pumping some life into his story on WSB at 6 Wednesday. Cavitt’s coverage from a Cobb Co. gas station had some surprising elements. An actual on-camera shouting match between a customer and a station manager. The customer accused the manager of hoarding gas for his friends. A motorist who admitted he’d stalked a tanker truck to see which gas station was getting a fresh supply. A picture of Cavitt and two other men pushing an out-of-gas car. Cavitt didn’t call attention to it, to his credit. But it was unmistakably him– his stick mic was clipped to his belt as he pushed. It was a nice bit of hands-on “reporter involvement.” It also helped him show the desperate straits of some of the motorists he encountered. Besides, when you do click on a green arrow for a particular station, you see that it/the info was, in some cases, last updated 20 hours ago! Or was presented/updated to show NO gas about 2-hours ago, yet the arrow remains green in color. (For “Go” presumably.) But hey, bad information is better than NO information? In this particular case, I think not. This entry was posted in cavitt, WSB, WXIA on September 25, 2008 by live apt fire. On Friday, there was a shooting and kidnapping in SE Atlanta. Two stations managed to get cameras to the scene, WGCL and WXIA. Their approaches to the story were completely different, and quite instructive. Both stations appeared to get the facts right. One of them produced a broilerplate, garden variety package. The other produced a rare thing of beauty. Here’s WGCL’s Ryan Deal, Friday at 4pm. Deal gives the story standard-issue treatment: A fusillade of too-many facts in too short a period of time. Soundbites that add urgency to the shooting part of the story while downplaying the most compelling part of it: The fact that a father watched in horror as his toddler was kidnapped. Deal’s piece discusses bullet holes, the consciousness of the victim, the fact that a dog was attacked, the whereabouts of the “shooter.” In so doing, he fails to convey to the audience why this story is worth watching. Watson’s story focuses on the woman who ended the kidnapping, an element completely overlooked in Deal’s coverage. Watson bypasses the on-camera interviews gathered about the shooting that started it all. Instead, she stays with the kidnapping and its conclusion. She matches pictures and words with elegance and simplicity. She never mentions the “shooter.” And her audience watches with a full understanding of what happened and why it was worth putting on TV. The photogs at both stations did a fine job of shooting the story, though WXIA aired better video. WXIA’s photog may very well have identified the child’s rescuer and alerted Watson to her importance in the story. In fact, we suspect Watson wasn’t on scene while much of the drama played out, and viewed the key video elements later. In the real world of breaking news, that’s not unusual. Deal is a sympathetic figure here. He worked hard to gather the material and to completely understand the head-spinning crime scene he was covering. He doubtless felt compelled to give his audience coverage that was as “complete” as he could muster. Most TV reporters would have done much the same. But Watson skillfully saw this story as a case of addition by subtraction, weeding out the extraneous elements that clouded Deal’s story. True, her story lacked the soundbites and natural sound hits that typically dress up local news packages. She never named or interviewed the rescuer. It didn’t matter. Local TV news rarely yields pleasure, especially when covering crime scenes. It was a pleasure to watch Jaye Watson’s coverage of this story. This entry was posted in deal ryan, watson jaye, WGCL, WXIA on September 23, 2008 by live apt fire. 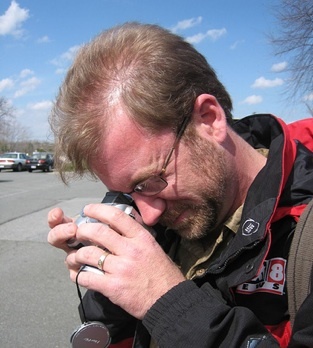 – WSB’s Mark Winne, Friday at 6pm, on an unsolved murder in Mechanicsville. This entry was posted in winne watch, WSB on September 23, 2008 by live apt fire.